Spring Training for the New York Yankees will feature at least two significant position battles, at first base and left-field and possibly more depending on the configurations the infield takes. Luke Voit and Greg Bird will both be vying for time at first base. Simply put, when the season ended, Voit had the offensive firepower but Bird has the defensive prowess at first base. Voit hit .333/.405/.689 with a 1.095 OPS in 39 games for the Yankees after being traded at the July deadline. He provided a significant impetus for the push toward the playoffs for the Yankees. Yankees General Manager Brian Cashman said when the season ended that Voit had earned the job going into this season. 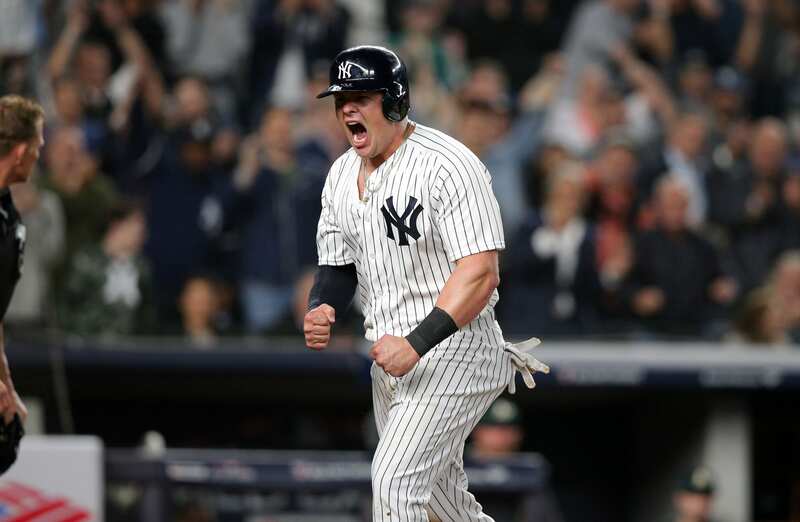 Voit has power and makes contact – will he continue his success in ’19? Bird, on the other hand, had a poor offensive showing in ’18, hitting a painful .199/.286/.386 with a .672 OPS. Cashman has said the job is his to win back and fans have been waiting for Bird to break out for several years, while he’s been hampered by one injury after another. Last season, when he appeared healthy, he had little success putting that lefty bat to good use for the Yankees. Fans would love to see Bird as Comeback Player of the Year this season. In left field, the Yankees can go with Brett Gardner, Giancarlo Stanton, or Clint Frazier. Fans were either thrilled or dismayed with the resigning of Gardner because many fans hoped that the Yankees would pursue Bryce Harper for left field; however, it’s February 3rd and there’s little chance the Yankees opt to offer Harper the sort of long-term deal he appears to be seeking. Gardner brings a veteran presence and elite defense to left field. His offensive contribution last season was .236/.322./368 with a .690 OPS and 12 homers in 140 games. Fans became frustrated watching Gardner hit out of the lead-off spot and garner a .322 on-base percentage. Stanton performed admirably, despite some gaffs, in the 36 games he was patrolling left field. Personally, I’d rather see him at DH, where he can hopefully stay healthy and have another MVP type of season. Will Clint Frazier get an opportunity in spring training to show that he is healthy and to show that he belongs in left field? Can he hit like he did for Scranton Wilkes-Barre last season when he was there for 48 games and hit .311 with 10 homers and a .963 OPS? The Yankees would love to get more offensive production out of the left field spot. Spring training is just ahead and these are just a few of the exciting position battles to keep an eye on – watch out for shortstop to be a hot spot on the field as well.